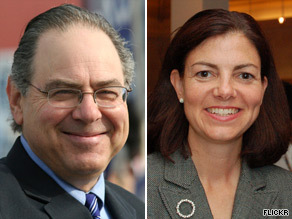 Rep. Paul Hodes and former New Hampshire Attorney General Kelly Ayotte are trading barbs in the race to fill retiring Sen. Judd Gregg’s seat. (CNN) - Former New Hampshire Attorney General Kelly Ayotte's Senate campaign isn't the only one revved up by Monday's endorsement from Sarah Palin - Democrat Paul Hodes is pretty happy about it too. "We couldn't be more thrilled that Sarah Palin chose to endorse Kelly Ayotte," Mark Bergman, Hodes's campaign communications director, said Tuesday during a conference call with reporters. "[…]The people of New Hampshire have already rejected Sarah Palin once in the general election and we're pretty certain we're going to do it again." "We call on Kelly Ayotte today to tell us that Sarah Palin will be here in October campaigning for her," Bergman said. "We hope she does. I mean, that would be really helpful for our campaign." Hodes, a one-term congressman, is running unopposed for the Democratic Senatorial nomination in the Granite State. Ayotte faces two GOP primary opponents. "Sarah Palin is welcome here anytime to call out Paul Hodes's false attacks," Ayotte's Communications Director Jeff Grappone told CNN. The Hodes campaign also launched a new television ad Tuesday attacking Ayotte for "duck[ing] responsibility" in the aftermath of the closure of Financial Resources Mortgage (FRM). The New Hampshire firm is accused of defrauding customers for millions of dollars and has been called a Ponzi scheme by investigators. Ayotte was attorney general during the time FRM allegedly conducted criminal activity. The Hodes campaign announced they would double their ad buy this week to $100,000 to air the 30-second spot in the Boston and Manchester media markets. The ad marks Hodes's second of the campaign season. The first – also an attack ad against Ayotte – was heavily criticized by the conservative New Hampshire Union Leader for including what it called "dishonest smears." Grappone says Hodes's latest ad is no different. "When professional politicians get desperate they resort to false attacks," Grappone said. "Hodes' first attack ad on Kelly Ayotte was universally condemned as misleading and untrue, and this vicious attack is more of the same." A non-partisan poll of New Hampshire voters conducted in April indicated that Ayotte led Hodes by 15 points in a hypothetical general election matchup, with just over one in five undecided. Governor Palin showing you support is alot better than nobummer or biden showing support for failed demorats because nobummer and biden are massive failures. Palin's endorsed candidate, Kelly Ayotte is leading her Democrat competitor by DOUBLE DIGETS!!!!!! Nuff said. This women is under the impression that she can make a difference. These types of personalities are the hardest to deal with. Just what has she ever done for the USA folks ??? She isn't even in state or national government. Does this not tell you of what the media HYPE has done for this ninnie and her misinformed supporters ??? Truely the GOP have ABSOLUTELY no one to look up too. She couldn't legislate herself out of room full of Mama Grizzlies. I just wish she move period – to somewhere we can't see or hear her... ever again. When Sarah talks people listen. The Democrats are afraid of her. I wish she'd attack me, I could use the money. What a moron she is. As a registered voter in New Hampshire, all I had to hear was that Sarah Palin (golly gee whiz) came out in support of Ayotte and I immediately went out and put up a Paul Hodes campaign sign in my front yard. Sarah: I know you can see Russia from Alaska, I can see the moon from my backyard but that does not qualify me to run NASA. I have a life-sized picture of a New Hampshire Republican inviting Sarah Palin (AKA the Caribou Barbie who could see Russia from her front porch) to campaign. New Hampshire voters frequently demonstrate that they ignore party rhetoric (right or left) and try to pick the best candidate. An endorsement from Ms Palin must be as much welcome as contracting a serious illness. uh snow – she isn't a governor – remember she quit half way through a term... not very 'patriotic', wouldn't you say. Kinda like you who shows no respect for the office of President of the United States. If you don't respect the man, respect the office. Every person who has served could tell you that – but obviously you have never served your country; just sat on your back-side complaining, letting others do the work for you. lol. No one, and i mean NO ONE in NH takes Paul Hodes seriously. He is counting on the Dems to bail him out or a misstep by an opponent to give him an upper hand because he is a massive do nothing. The Dems say 'jump' and he says how high? The Democrats in NH are relying on the Mass. transplants to pull off the election for them. Here's the problem. People from NH don't want to be Taxachusetts. The folks from Mass move up to NH because they can no longer afford the cost of living in Mass but then decide to foist their Liberal, spendthrift policies on NH. Look what has spread from NY to CT, NJ, RI VT and now ME and NH! With Obama's approval rating at 40% in NH I can only hope sanity will continue to prevail in my state. can't wait for Hodes to be gone. How can anything this bimbo does not backfire oner moronic mind. I think we need to "Refuduate" her! and her pea brain! Palin is an elite and is loving the lime light. She once accused Obama of being an elite and now we see who really is one. Sarah a destructive force and is all about herself. Getting a political endorsement from Sarah Palin is like getting marriage couseling from O.J. Simpson. I'm getting the sense that their are some sexist undertones to all of this liberal criticism. Perhaps the progressive groups should come out and repudiate the sexist elements in their movement.